"Absolutely riveting! 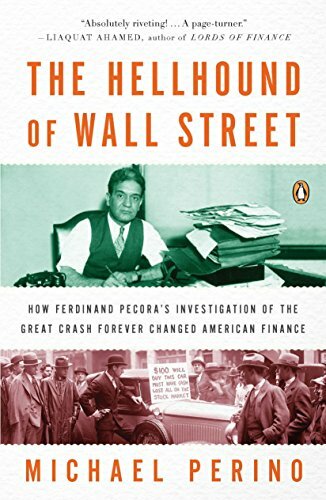 Michael Perino's account of the 1933 Pecora hearings-the sensational revelations of shady business practices at the highest levels on Wall Street-is a page-turner. No one can read about the many excesses of Wall Street in the 1920s without being struck with the similarities to today and wondering why we have allowed history to repeat itself." "A brilliant and compelling account of how Ferdinand Pecora figured out - and exposed in nauseating detail - the malpractice of Wall Street. As we struggle to confront our modern financial demons, we should all pause to read and reflect on Michael Perino's account." "A thorough, well-written history that shows how the past can be prologue." "Hats off to Michael Perino. The Hellhound of Wall Street is an excellent account of the Pecora hearings that should be read by everyone interested in financial reform. At the same time, it is a penetrating Wall Street morality tale that should evoke a strong sense of dTja vu in its readers." "It has taken another economic melt-down to restore public recognition of Ferdinand Pecora as the most effective investigator of financial wrongdoing in American history. Michael Perino deftly recreates the dark days of 1933, when that shrewd New York prosecutor turned Senate committee counsel forced Wall Street's biggest bankers and brokers to admit how they contributed to the nation's slide into the Great Depression." "The Hellhound of Wall Street is a masterful evocation of the politics, finance and personalities when Congress last addressed systematic reform of our financial system." "The Hellhound of Wall Street is an incisive and timely book about a man and period in our country's history when a presumptuous, reckless Wall Street elite, very much like the one that's caused such ruin today, met its match. We badly need a second Ferdinand Pecora now. Michael Perino provides brilliant analysis, telling anecdotal material, and wears his deep erudition easily. He has given us a vital cautionary tale from the past that is a pure pleasure to read." A riveting courtroom drama with remarkable contemporary relevance, The Hellhound of Wall Street brings to life a crucial turning point in American financial history: the 1933 hearings that put Wall Street on trial for the Great Crash. Michael Perino recreates the ten dramatic days when Ferdinand Pecora, a Sicilian immigrant turned Senate investigator, cross-examined the officers of National City Bank (today's Citigroup), particularly its chairman, Charles Mitchell, one of the best-known bankers of his day. Pecora's rigorous questioning exposed City Bank's shocking financial abuses, revelations that galvanized public opinion and led directly to the New Deal's landmark economic reforms.